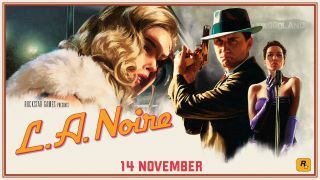 Rockstar Games has confirmed that a remaster of LA Noire is coming to current generation systems (including the Nintendo Switch), as well as a special VR version featuring seven cases from the original game. This is the first time a Rockstar Game has appeared on a Nintendo console since Grand Theft Auto: Chinatown Wars came out on the Nintendo DS in 2009. LA Noire was originally released for Xbox 360 and PS3 and saw you working as a detective to solve a number of cases in 1940s LA. Although the game featured more traditional shooting and driving segments, much of it was focussed around gathering evidence from suspects. Rockstar invested heavily in its facial animations to give the player the ability to read when a witness was lying or telling the truth. Although the game was received well by critics, its developer Team Bondi went out of business shortly after its release, which lead to many assuming we would never get to see more from the franchise. In addition to the remaster, Rockstar has also announced that it will be releasing LA Noire: The VR Case Files for the HTC Vive. This VR experience will feature seven cases from the original game rebuilt for virtual reality. "With each of the seven cases rebuilt for virtual reality, players can use real world physical motions including grabbing, inspecting and manipulating individual clues or using the detective’s notebook to make notes or draw freehand," reads the HTC Vive blog post accompanying the news. Vive owners will be able to "experience first person driving in VR with additional real-world vehicle interactions including steering, operating car doors, changing radio stations, shooting from vehicles and much more." Meanwhile the Nintendo Switch version will feature platform-specific enhancements, including motion-controls and HD rumble. The game will also come with support for the PS4 Pro and Xbox One X, where it will run at 4K. The remaster will arrive on November 14 for Nintendo Switch, PS4 and Xbox One, while the release date of the VR version of the game is yet to be announced.